"3LA1, V-1963" by Timothy K. Perttula and Robert Z. Selden Jr. CONTEXT INFORMATION: Excavated from a plowed-out grave found by Dan Jenkins. 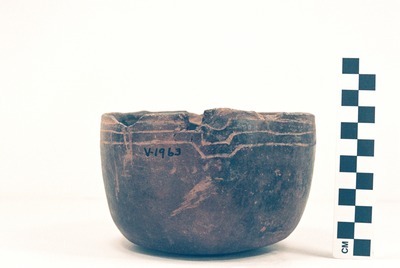 This vessel is associated with V-1962. DECORATION: Three horizontal engraved lines on the rim; the horizontal lines dip below the thickened and flanged part of the lip. On the lip itself are two excised teardrop-shaped areas.